The AUB years were the best years in my life. And I owe them to one man: Constantine (“Costi”) K. Zurayk (1909-2000). He was an intellectual and moral giant whose generosity funded my undergraduate years at the American University of Beirut. My first concern, after enrolling at AUB in 1954 and managing to settle my first semester tuition, was finding a sponsor to fund the ones after. My parents couldn't possibly have managed three years of university education for me. My big break for the second semester was winning a scholarship for needy students granted by Zurayk. I held on to the Zurayk Endowed Scholarship for another four semesters leading up to my graduation. The scholarship covered my tuition fees in full -- plus a small allowance. I was three months into my sophomore year when Zurayk became acting president of AUB following the sudden death of President Stephen B. L. Penrose in December 1954. He kept the position until the July 1, 1957 Commencement ceremony. J. Paul Leonard assumed office as president of AUB and I received my “Bachelor of Arts with Distinction” in economics on that day. The degree landed me a decent job, which in turn allowed me to fund my postgraduate studies gradually and pick up my Masters in economics in 1962. When I first applied for the need-based Zurayk Endowed Scholarship, I had to complete a financial aid form showing I could not meet the cost of tuition. My classmate George T. Yacoub, a sheer Ras Beiruti, was looking to fill a similar form for another need-based scholarship. He suggested we turn to the mukhtar (district chief) of Ras Beirut, Jirji Rubeiz. His office was at the joint of Jeanne d’Arc and Mak’hool streets, some 200 meters from AUB’s Main Gate. An affable and witty man, mukhtar Rubeiz knew the circumstances of every resident family in Ras Beirut. He quickly gave us two signed and sealed documents on his letterhead. Each stated in his handwriting: “I, mukhtar Jirji Rubeiz, by this certify that (name) has no funds or property.” His crisp statement won us the scholarships. 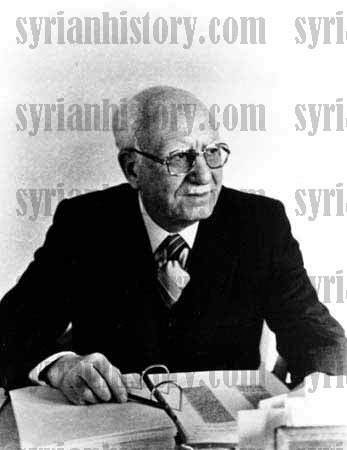 Zurayk was born to a Christian Arab family in Damascus in April 1909. He received his Bachelor of Arts from AUB in 1928, his Doctor of Laws from the University of Chicago in 1929 and his PhD from Princeton University in 1930. In nearly 50 years at AUB, he served as Professor and Distinguished Professor of History and Arab History, as Emeritus Professor of Arab History and Archaeology and as Vice President and Acting President. His major work was Ma’na an-Nakba (The Meaning of the Disaster). Published in 1948, the book offered the first major intellectual critique of Arab society. Zurayk’s lifelong concern was the issue of reform and how to move the Arabs from their "backward" state into the modern world. “Our problems in Arab society are… problems of culture and civilization." His identification of the ills of Arab society and his advocacy of education as the best tool for reform remain enshrined in my mind. So are the values of liberty, diversity independence, democracy, justice, education, human rights and free enterprise. 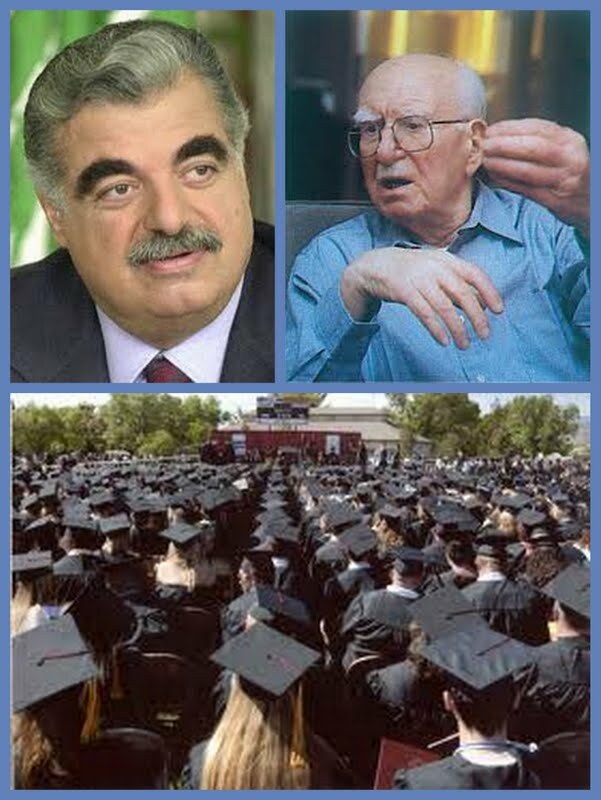 Zurayk and other faculty members – chiefly Cecil Hourani, Yusuf K. Ibish, James Batal, Yusuf A. Sayegh and Paul J. Klat -- instilled these in me. -- Topping all students in the School of Arts and Sciences in my senior year with a grade average exceeding 90 percent. -- Serving successively as president of the Economics Society, president of the Civic Welfare League and editor in chief of Outlook, the student weekly. -- Setting new AUB weightlifting records at the 1957 Field Day (see “Brawn and Brains” posted on ________). “I am happy to inform you that the Board of Academic Deans has approved the recommendation of the Dean and Faculty of Arts and Sciences that you be granted the Penrose Award for the academic year 1956-1957. “This award is granted to the outstanding student of each of the four Faculties of the University, on the basis of scholarship, character, leadership and contribution to university life. “Your name will be engraved on the Plaque which has been donated by Mrs. Penrose in memory of the late President, Dr. Stephen B. L. Penrose Jr.
“In communicating this action to you, I wish to express my sincere congratulations and my best wishes for the future. It is our firm hope that your record after you graduate will reflect credit on yourself, your Alma Mater and your country. Growth of the financial aid program at the University over the years is remarkable. For example, 2,765 students -- or 36% of the total enrolled in 2008-2009 – received $11.6 million in financial aid, mostly as need-based grants. That’s an average of $4,195 for each recipient. An extra $4 million funded graduate assistantships and student employment. Credit goes to the generous support of AUB alumni, former students and friends. Many people choose other ways to “give back.” Mahmoud Z. Malhas, a dear friend and fellow 1957 graduate in economics whose scholarship benefactor was Vice President Archie S. Crawford, “gave back” to AUB through a $600,000 gift to renovate the Common Room. The newly named Mahmoud Malhas Common Room, which serves a multipurpose student area in West Hall, opened in November 2008. Mahmoud had also contributed toward rebuilding College Hall in the 1990s. My and Mahmoud’s midfifties “rat pack” included engineering graduate Suhail Bat’heesh, among others. Suhail, who passed away in March 2001, “gave back” from the grave. In his memory, his widow Etaf gave $440,000 to renovate the West Hall Theater. The New Suhail R. Bat’heesh Auditorium launched in February 2003. His son, Prime Minister and Trustee Saad-Eddeen Rafic Hariri, elected “to honor the memory of his late father by naming and endowing the Rafic Hariri School of Nursing at AUB.” His gift covered costs to renovate and equip the new building, set up a faculty chair in nursing and bankroll Hariri Scholarships for nursing students. 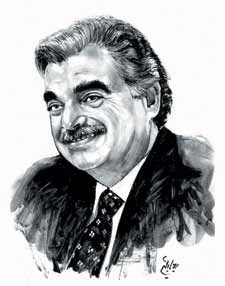 Rafic Hariri has left a legacy of philanthropy through the Hariri Foundation, which he set up in 1979. It testifies to the importance he gave to the quality education of future generations. So far, the Hariri Foundation has helped educate more than 35,000 Lebanese students in the finest universities at home and abroad, including the United States, France, the United Kingdom and Canada. I never met the late Hariri one-on-one. Throughout his tenure as prime minister I lived in London where I founded and edited Mideast Mirror. It was an online publication offering subscribers a daily English-language digest of political and economic news and views from across the Middle East. It was delivered to subscribers worldwide, including foreign and other ministries, government agencies, embassies, think tanks, research centers, lobby groups, major media and international organizations and specialized groups in the United States, Europe and Japan. On 16 December 1996, the “Friends of Lebanon” conference – co-chaired by the United States and Hariri -- was held at the State Department in Washington. Some 30 nations and eight international financial institutions attended the conference intended to solicit pledges to finance rebuilding Lebanon. I thought Mideast Mirror, which went out to subscribers in the early afternoon London time, had to cover the Washington event in good time. The full text of Hariri’s opening speech would be a fitting curtain raiser. I rang seasoned political writer Khairallah Khairallah (KK to his friends) in London. I asked him if he had a phone number for any Hariri aide in Washington who could give me a copy of the speech. He said he only had one for the hotel where the team was staying. I waited a couple of hours until it was midday in London and dialed Washington. I explained the reason for my call. “Then please ring Nouhad on this number (which he gave me), tell him you woke me up and ask him to fax you the speech. He’ll do it right away.” And Mashnouq did. The “Friends of Lebanon” conferees pledged $1 billion in near term investments for rebuilding Lebanon and another $2.2 billion in long-term investments. Washington’s contribution included development aid, agricultural credits and $2.1 million in grants for AUB. Good men like Hariri and Zurayk never die.